The Chrism Mass was celebrated by Rt. Rev. 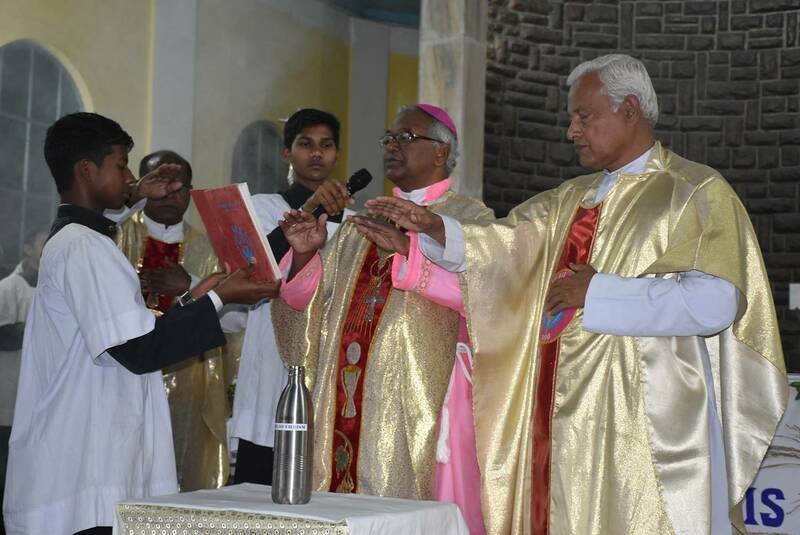 Joseph Aind Sdb, Bishop of Dibrugarh at Sacred Heart Cathedral Church on 27 March 2018 at 5 pm. The Chrism Mass which the Bishop celebrates with his Presbyterium manifests the communion of the priests with their Bishop. Around 150 priests comprising of the Priests of the Diocese as well as priests working in the Diocese took part. There were also more number of Sisters and lay faithful who took active part in the celebration. It also manifests the unity that exists between the Bishop and the priests. It is also the celebration of the priesthood day. The local church joins the universal church in commemorating the foundation of priesthood and the Holy Eucharist by Jesus during His last supper. Priesthood in the Church is for service in the Church for the people of God. Priest like Moses in the Old Testament is a representative between God and his people. During the Chrism Mass the Oils of Catechumens, Oil of the Sick are blessed and the Oil Chrism is consecrated in a ceremonial way. The Oils are used during the year for various purposes. The oils are carried to all the parishes for their use during the year.